The Taxpayer Opportunity Network and CFED have crafted ways to spread the word about the EITC in 5, 10 and 30 minutes. The EITC Awareness Day Toolkit also includes state-by-state data snapshots and sample social media posts in both English and Spanish. The Center on Budget and Policy Priorities’ Get it Back Campaign has created social media posts and shareable graphic to use on twitter and facebook. 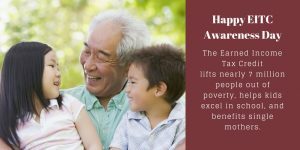 The IRS’ EITC Awareness Day resources includes press releases and basic marketing materials.